Sounds like a lovely retired life. Know there are always delays and side projects — but what I do know about you is that your gardens will be spectacular. Kevin, I’m in no danger of becoming one of those people who can’t figure out what to do with themselves in retirement. (I’m guessing that no gardeners are in that group!) I don’t know about spectacular; I’m noticing that while I’m busy creating this new front landscape, the older parts of the garden are looking a bit neglected. Jean, your progress is impressive. The clover path sounds quite wonderful and I think you are very wise to wait before designing the shrub border. How I envy you, being able to take such interesting courses. We have nothing similar nearby. Pat, When I thought about sitting in class in October and realizing all the bad choices I had made with the just-completed shrub border, I knew I had to put it on hold. I agree that the Coastal Maine Botanical Garden courses are a wonderful resource. Because the classes are short and intensive (usually all day for two consecutive days), people do come from a distance to take them. One man who has been in a couple of different classes with me, for example, comes up from Annapolis, Maryland for them. I could imagine you finding it worth your while to come down to Maine for a few days to take something like Bill Cullina’s “Horticultural Ecology” course (offered for two days in early September). Your suggestion of coming for a course or two is very tempting. I’m going to check out the offerings. 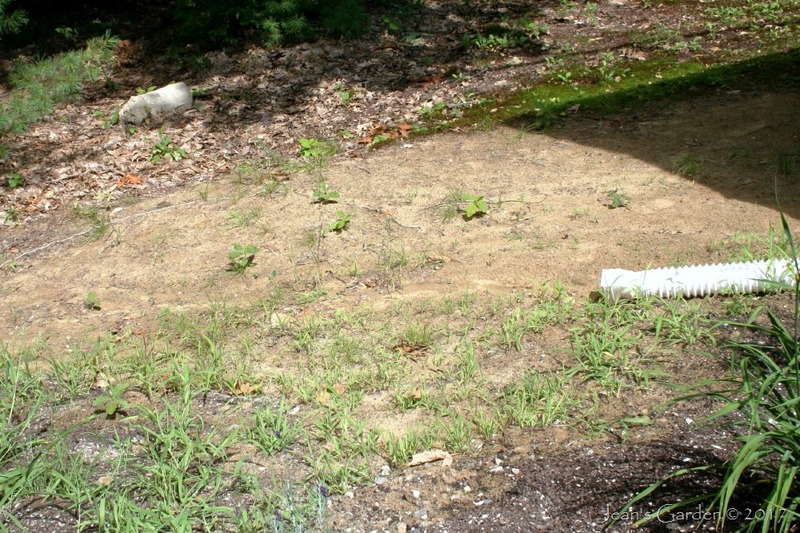 Your side slope is looking wonderful already, Jean. 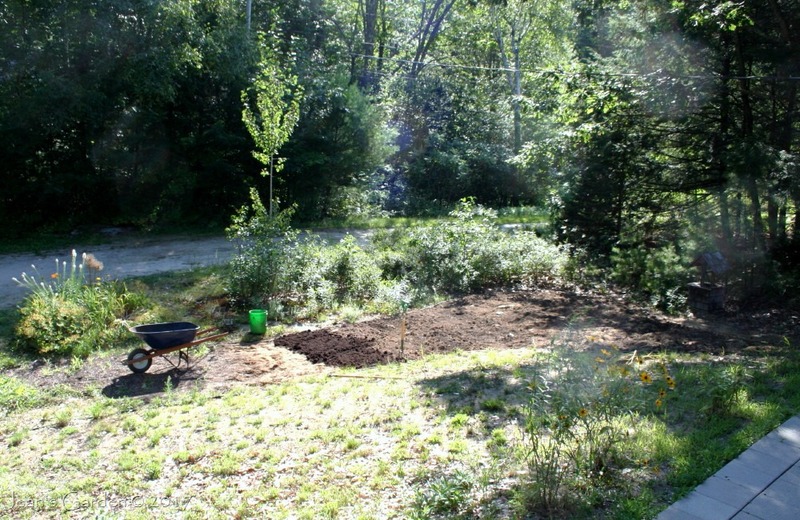 I can appreciate the “slog” aspects of some garden projects – I felt much the same way about pulling out our lawn, laying paving, and planting flat after flat of thyme, but it did make a huge difference in the garden’s appearance. I hope you’re able to complete the clover path within your new timetable. I’ve 2 major garden projects in my queue but both are on hold until the worst of summer’s heat is behind us so I have to keep my impatience in check awhile longer, which is a different kind of challenge. Kris, I think all jobs worth doing include some aspects that are a slog, but that you push through to get to the parts you love. (When I was teaching, the “slog” part was grading papers.) I’m making steady progress on the clover path. Two more days of soil preparation and then I can seed this weekend. Unfortunately retirement does not mean more time to do all those jobs. I have found that it is easy to start taking on new responsibilities and new hobbies with the result one has less free time. Certainly some of my garden projects keep getting delayed due to some unexpected event. Steve, Retirement does mean that I can spread big jobs like this out over more days and weeks than I did when I was working — which is good because my body will no longer tolerate the kinds of 8-hour days of hard physical labor that I engaged in 20 years ago! Hello Jean, I though we had an aggressive schedule but it sounds like yours is punishing with the time constraints on when classes are taken and windows for seed-sowing. We haven’t made any new borders in our garden this year as the plan is to sort out the rear-half. Unfortunately, I under-estimated just how much work was required so we’re behind on this and I’m not sure what we’ll manage to finish before winter! 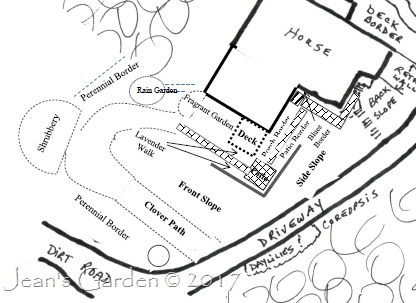 Sunil, I could spread out this big landscaping project over more years — but I’m coming up on my 70th birthday and figure I had better get it done while I am still able to! Wow, three years! It doesn’t seem that long to me, but look at your progress! i admire your organization, and I am confident your final plans will be completed on time. And then, no doubt, you will start plans for another project! Deb, LOL, I do, of course, have ideas for another project after this one. And then there are those older flower beds in the back garden that are beginning to look a bit forlorn and in need of renovation. Kathy, It’s one thing to make mistakes with perennials which are relatively inexpensive and can usually be moved easily. Shrubs are a whole other matter! I’m definitely a “slow and steady wins the race” tortoise type, which means that I usually achieve my goals. 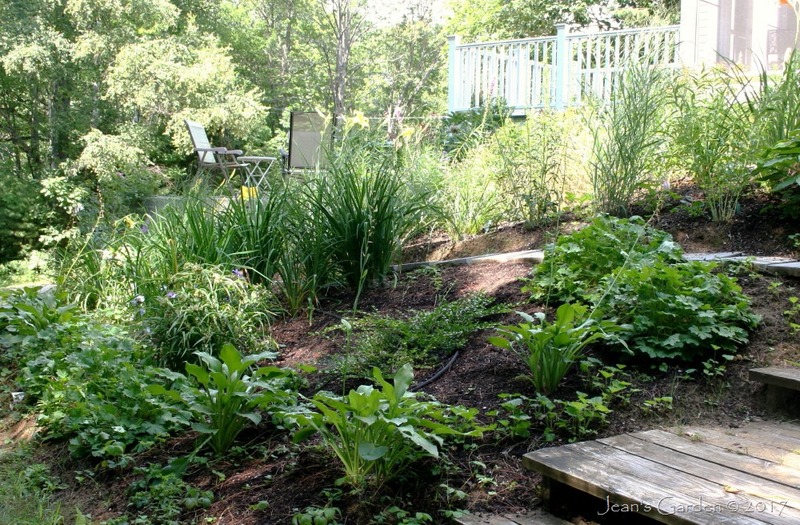 You put me to shame with all your garden projects Jean….I have so much to clean up and redo and hope my body cooperates this fall. I like the idea of the clover….mine came by itself into the grass paths and I left it for the wildlife.